Canadian Family Physician (CFP), a peer-reviewed medical journal, is the official publication of the College of Family Physicians of Canada. The April 2018 issue of Canadian Family Physician was accompanied by our first ever special supplemental issue of the journal. 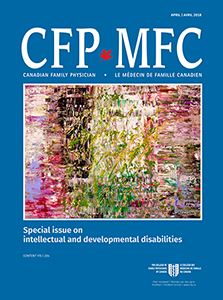 This is the first of 2 special issues full of practical content that complements the 2018 Canadian consensus guidelines for the primary care of adults with intellectual and developmental disabilities (IDD), published in the April issue. The theme of this special issue is the primary care of younger adults with IDD. The second special issue, coming in April 2019, will focus on adults with IDD during later life phases.